Logic appears to have been thrown out the window nowadays. A return to the rigors of logic and critical thinking can help solve a lot of the problems we face today. Many act on their feelings, and feelings are fleeting, which means that we’re constantly shifting positions and getting nowhere in the process. As a result of this adherence to emotion, many people and businesses often fall prey to the trap of logical fallacies. A logical fallacy is an incorrect argument in logic and rhetoric that contains a fatal flaw which undermines its soundness, thereby leading to an erroneous, and potentially damaging, conclusion. Businesses can’t afford to make logical fallacies. Unfortunately, businesses can and do commit these fallacies, and the consequences are often immediate and, if not, eventually come and wreak havoc on their bottom line. In order to better understand the affects of logical fallacies on business, let’s just focus on one aspect: decision making. How can logical fallacies harm your decision-making process? 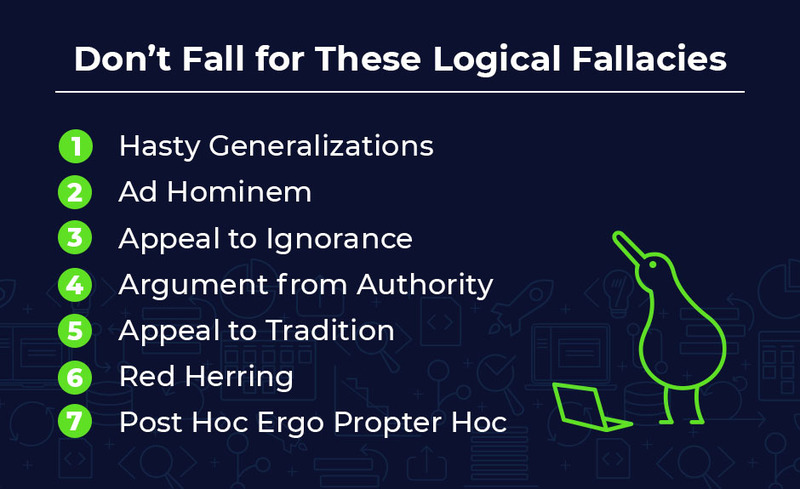 In myriad ways, but for the sake of brevity we’ll examine seven examples of logical fallacies that should be avoided. In short, a hasty generalization is when you neglect to perform your due diligence. It’s making a decision without all the facts having first been gathered and understood in context of the decision you’re making. For example, let’s say you’re going to exploit what you see as a consumer need for some kind of widget. To support the viability of the project you sample a small group to gauge their interest in the product. They love it! But maybe that group is geographically predisposed to liking that product. Perhaps they live by a river with great trout fishing, and your product is a new-fangled lure. So, you produce the product nationally, and lo and behold, sales tank where there’s no body of water. That’s a very simple example to state the obvious: don’t decide until you have a deep, rich pool of information. Reporting tools and surveys can help you collect the necessary data to avoid hasty generalizations. The classic ad hominem fallacy is when the listener attacks the person who is advancing the argument and ignores what they’re actually saying. This might seem unlikely to impact business decisions if you work for an organization that hires only the best and the brightest. That might be the case, but there are going to be team members who you personally don’t connect with, even though they excel at their job. If this person is arguing, say, why a project must be aware of a certain risk, and you dismiss them because they’re always complaining, you’re making a logical fallacy. People who work together might not otherwise spend time together, and people who work together often become irritated with one another’s habits or quirks. That’s normal. But you must be professional. It’s okay not to like somebody, but give their argument its due. Be dispassionate and see if it makes logical sense within context. Ignorance isn’t a proof. Ignorance merely shows that one doesn’t know something. If someone argues that your organization shouldn’t pursue a project because no one has ever been able to achieve its objective previously, that is not a solid argument. Appealing to ignorance is used more often than you’d think. Be on the lookout for it. Of course, we’re all ignorant of many things, even those things that revolve around the subject of the argument, but that doesn’t mean we throw up our hands and give up. It means we do the research and learn before making a decision. Plus, being innovative requires taking risks and being aggressive. We’re told to respect authority, which is not inherently a bad choice, but it can lead to the logical fallacy of an argument from authority. Naturally, if your boss is making the argument, you’re more likely to listen and believe it to be true. But just because it’s coming from your boss, doesn’t necessarily make the argument correct. But the argument from authority doesn’t need to come from a person in the organization who literally has authority over you. We give people authority all the time for little to no good reason. Have you ever been at the supermarket and picked up a product, thinking: “I hear this is great!” Then you realize you heard that from a spokesperson on a TV commercial. It’s important to only trust a person in authority if they’ve earned that trust because they’re knowledgeable, experienced and skilled. But even in such cases it never hurts to run their argument through the ringer to make sure everything makes sense before you agree. Another logical fallacy is when you think, “We’ve always done things this way, so it must be right.” Wrong. That’s called an appeal to tradition. This, like all logical fallacies, is when we get lazy and turn off our minds. It’s an easy thing to do, coast. We work hard, have responsibilities at home, etc., so sometimes we just don’t think and blindly assume that since it’s tried and true it’s the right decision. Only, things change, and if you’re not flexible you’re going to end up broken. That doesn’t mean that tradition is wrong, but neither does it mean that it’s right. Often an adherence to tradition means a reluctance to try new things. That means a retreat from innovation, which is bad business. A red herring is something irrelevant that is raised to deflect attention. It’s used all the time in lazy filmmaking to mislead the audience, and it’s often found in an argument to distract one from making a good decision. For example, let’s say someone is trying to get you to construct an apartment building on marshland that is liable to flood and not sustain the weight of a large structure. To distract you from this fact, they move the conversation to the vacancy rate in the area, great shopping nearby and how it’s a transportation hub sure to attract all those commuters looking for a place to live. Just because there’s a need and an infrastructure is in place, doesn’t mean you want to build on a plot that is going to threaten the integrity of your project. But the obvious deficits can be hidden behind benefits that are in fact red herrings to corrupt your decision-making process. That’s a mouthful which translates to “after this, therefore, because of this.” This logical fallacy refers to making failed causal inferences due to sequence. In other words, one action following another does not mean there is a causal link. It’s true that correlative metrics is where one can begin when looking for optimization opportunities. But without investigation you’re proceeding on shaky ground. For example, if people are buying your product because of an advertisement that you placed, that doesn’t necessarily mean the ad is working. There are too many other variables that must be considered before substantiating that claim. Correlation can offer insight, but without running controlled experiments, it doesn’t prove causation. Relying totally on correlation, without establishing causation, is a logical fallacy that can harm your business. The opposite of a logical fallacy is sound logical thinking, which will bring you to ProjectManager.com, a cloud-based project management software that helps you plan, track and report on jobs no matter how small or large and complex. This is one decision you don’t have to worry about. To make it even easier, take this free 30-day trial and do the due diligence.